For those of you who don't know much about American football, Brett Favre is a living legend who, for two consecutive years, tearfully announced his retirement then came back the following season with a different team. Last night his current team, the Minnesota Vikings, lost their chance at going to the Super Bowl largely because Favre made an ill-advised pass that was intercepted at the end of the game. Sidenote: What is it with athletes and fake-retiring? Justine Henin and Kim Clijsters did the same thing in tennis. Why can't they say, "I'm taking a break"? Or "a leave of absence"? Is it really retiring if you can just come back in a couple of years? Or in Favre's case, a couple of months? What he calls "retirement" everyone else calls "the off-season." I went into the game sort of rooting against Favre. I may have called him a lying cry baby. I may have made jokes that the referees were calling Elder Abuse penalties every time Favre ate turf after a big hit from the opposing team's defense (which was often). And that's when it happened: I actually started to feel bad for the guy. I realized they were hitting him hard on purpose. Granted you always gain from rattling the opposing team's quarterback, but this guy is fragile! He's the grandpa of football! They could have killed him! And then they kept showing shots of his poor wife looking worried and even covering her eyes whenever some tank in spandex pummeled her husband. ...and so forth, etc.) and I'm just tired and beat up. No really. I didn't get anything accomplished this weekend, and only partially because I took a sleeping pill that basically turned me into a zombie from Friday midnight until...right now, actually. 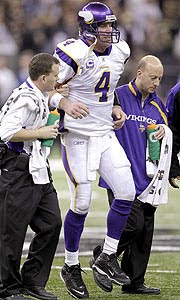 All this is to say, I'm retiring Favre-style. Which means: I'll see you guys in a couple days. I was rooting against Favre because I don't like him either. Don't feel sorry for him because he is old. He knows perfectly well who he is playing against every game. If he thinks he can take on the young guys, then he deserves what he gets. Now I am cheering for the Saints in the Superbowl because A) I already own lots of black and gold. :) And B) I can't stand Peyton Manning even more than I can't stand Brett Favre. It was a good game. I think Favre is admired in the league because he does things on his own--he plays every down as a risk-taker and in end the strategy either makes him a hero or a goat.